Dragon Fury is a spin-off from the Dragon Lore series and can be read as a standalone. 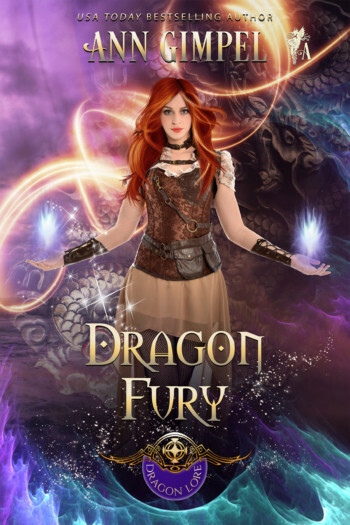 All your favorite characters–or a bunch of them, anyway–are in Dragon Fury. Join me for myth, magic, the incomparable Highlands, and Selkies! Aegir, the Selkie king, has a lot on his mind. He and his pod all but raised a young seer, and it damn near kills him to turn the boy over to his father. Especially when the father makes it abundantly clear he plans to erase the lad’s memories of his first two years. Fuming, Aegir retreats to an island in the Orkney chain that holds a gateway to Arcadia, a magical land protecting the source of White Magic. One morning, a strange Selkie catches his eye. Alarmed, he swims out to investigate. Unknown Selkies are bad news. Either spies or rejects from their own pods, they’re never welcome. Raene spends most of her time running a small bakeshop in the Highlands, but she seeks refuge in the sea once a year. She’s only just taken her seal form when another Selkie accosts her. It’s obvious he wants her to clear out, but she stands her ground. It’s either the bravest thing she’s ever done, or the stupidest. He might be rude and abrasive, but she has a problem, and he’s her best bet to solve it.